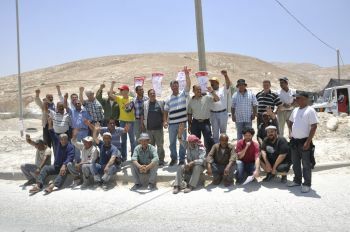 On June 16, 35 Palestinian workers at Salit Quarries in Mishor Adumim (a settlement area east of Jerusalem) began a general strike. The workers, organized with the independent Union WAC-Ma’an, are demanding an end to exploitation and humiliation, and insist on signing a first collective agreement. The strike began after the workers and the union approved a draft agreement, while the management tried to take advantage of the opposition of a small number of more privileged workers in order to break the union and avoid the agreement. WAC and the workers demand that the agreement be signed immediately. If the agreement is not signed, the strike will continue. On April 11, 2011, at a general meeting of the quarry workers, WAC’s National Coordinator presented the draft of a first collective agreement for the quarry. The agreement was reached after more than a year of negotiations with the quarry management. It was translated into Arabic and the workers weighed the important achievements against the demands that were not fully met. Finally, a vote was taken and a decisive majority approved the agreement. A small minority of workers on a higher wage scale claimed the agreement was inadequate and voted against. When WAC reported to the management that the workers had approved the agreement, it was expected they would go forward with the signing. A date was set for the signing, May 2, but at the last moment the quarry management began working intensively to break up the workers and drive a wedge between them and WAC . Meetings were repeatedly postponed, and finally we declared a labor dispute and strike. The management’s behavior during the last couple of months and its attempts to take advantage of the opposition of the minority of workers to act against the workers’ committee and the union left us with no choice but to declare a strike until the agreement is signed. Salit management betrayed the confidence of the union and the workers. Only an official collective agreement can rebuild this confidence. WAC and Salit Quarry workers are determined not to work without an agreement. The organization calls on the management to come to its senses and sign the agreement immediately. For a full presentation of the details of the situation at the quarry, the process through which the union was built in the Quarry and the issues at the heart of the negotiations see article.